Previous Post: Jai Jagaddhatri ! May Master be with you and bring you all peace and prosperity! Glad to read that Swamiji will be conducting Tirukkural classes. Tirukkural is one of the world famous set of poems that has been translated into largest number of spoken languages. I wish more and more people attend classes and benefit from it. 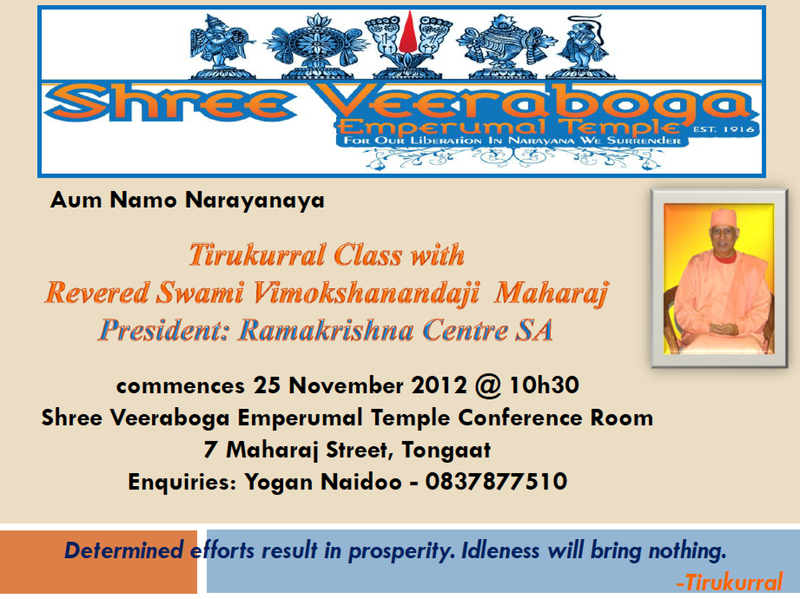 Just I returned from Tongaat after taking the first class on Tirukkural. It was not a big crowd but keen students of all age groups, attentive throughout the one-hour Talk. Gave an intro about Tamil language, the wonderful life of Tiru-Valluvar and Vasuki, the broad structure of Tirukkural and explained the very first verse. How wonderful to think in Vedantic terms! By Master’s grace, it was indeed a special and blessed moment for me to sit at this lecture. Thank you Swamiji for bringing out the universal language of God so beautifully (as always). Sadly, the hour elapsed too soon! Eagerly await the next session! Happy to see you at the class yesterday! Yes, from ancient time, the indian mind never was satisfied with close-circuit thoughts. It always expanded to universalism. Tamil literature is abound with such wonderful thoughts that run parallel to the Vedantic ideas found in the Upanishads, Gita etc of the Sanskrit literature. Essentially a language is a communication tool, a means to talk between man to man and man to God leading to ‘where the mind does not reach’, where thoughts cease to exist. This is possible only with the language of love. May our respects be to every sage and saint – sarva rishi munim ki jai – as we proclaim at the end of our satsangs! Finally, I know what Tiru means. thank you Maharaj. Good that you learnt something new! As Master says, “As long as I live, so long do I learn”.